by Brianna Crandall — February 21, 2018 — Global furniture and technology provider Steelcase recently revealed SILQ, a chair that the company intends to transform seating design. Through an innovation in materials science and a patent-pending process, Steelcase designers and engineers created a new high-performance polymer material that emulates the qualities of carbon fiber at a mass market price. This material, combined with the natural curves of the design, allows SILQ to respond to movements of the human body without the complicated mechanisms typically required in high-performance seating designed for the workplace. The result is a chair that Steelcase claims behaves more like an organism than a machine. The idea behind SILQ comes from our deep belief about design. The visual language, performance language and material composition should come together to create something that’s truly unique. We took inspiration from aerospace, the motion of a high-performance prosthetic leg, and sculpture, among other things, to understand how the combination of advanced materials and shape could create a simple system that is incredibly thin, extremely strong, and highly responsive. The all-new design for SILQ intuitively responds to human movement without the use of mechanisms. The way SILQ is shaped, what it is made of, and the way it performs are inseparable. We pushed the boundaries of materials science, and the material became the mechanism. SILQ is designed for the way people work today, says Steelcase. People at work are moving from one space to another and are less likely to sit at an assigned desk all day. They have less time to adjust mechanisms, and need a chair that is intuitive to use. The way SILQ responds to a person’s posture and stature is unique to each user because of the way the materiality, design and motion of the human body come together. Height is the only adjustment necessary for a tailored and unique experience, notes the company. SILQ offers an expansive variety of material combinations, including digital printing options, to allow interior designers and specifiers to create virtually limitless custom versions for their clients. The chair will be available in the new high-performance polymer as well as carbon fiber. It will be available in North America and Asia in spring 2018, and in Europe, the Middle East and Africa in fall 2018. 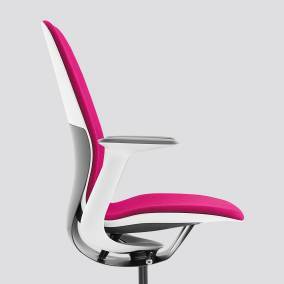 For more information about SILQ, visit the Steelcase Web site. Steelcase has offered a comprehensive portfolio of architecture, furniture and technology products and services for 105 years through its family of brands, including Steelcase, Coalesse, Designtex, PolyVision and Turnstone.